Go to the intersection on the table between the Affecting and Affected parameters ( for example, the intersection of how "Frequency Range" affects "Phase Noise" is J.2."). The figure appearing in the intersection ("J.2." in our example ) indicates where the explanation on the Effect appears in the text: the letter indicates the Article and the number indicates the Sub-Article (for example, "J.2." refers to Article "J", Sub-Article "2"). Empty cells indicate that the effect of the Affecting Parameter on the Affected Parameter is insignificant or does not exist at all. 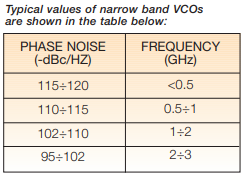 A. Parameters Affecting VCO Frequency Range The following parameters affect the VCO Frequency Range. • An increase in tuning voltage range widens frequency range. • Lower sensitivity means a narrower frequency range for a given range of tuning voltage. • Increased pulling causes decreased effective frequency range. • An increase in the range of the ambient operating temperature causes a decrease in the VCO's frequency range and vice-versa. • To improve pulling, output power should be reduced by connecting an attenuation circuit at the VCO output. • Improved pulling can also be achieved by connecting a buffer amplifier at the VCO output port. However, this buffer amplifier requires a higher supply current. • From an ambient temp of +25°C: a temp decrease to -55°C results in an output power increase of 0.5dB to 1.0dB typically. • As the VCO frequency range is increased, the difficulty to achieve a flat output power is increased. • As the tuning voltage range is reduced and narrowed, a flatter output power can be achieved. 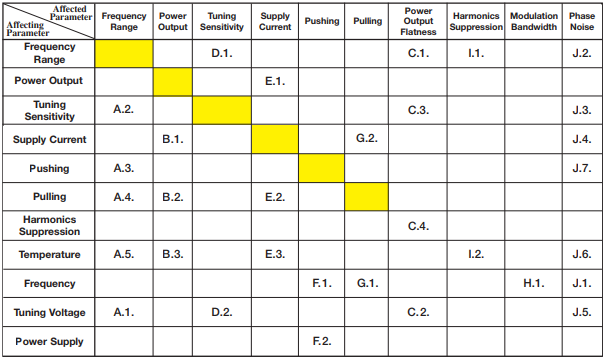 • It is more difficult to achieve flat output power for high tuning sensitivity than for low tuning sensitivity. • Adding an output filter to suppress harmonics may in some cases degrade power output flatness. • For a given tuning voltage range, increasing the frequency range requires an increase in the tuning sensitivity, and vice-versa. • For a given frequency range, increasing the tuning voltage range decreases the tuning sensitivity, and vice-versa. • Increasing power output requires higher supply current. • From an ambient temp of +25°C: a temp increase to +85°C typically results in a supply current increase of approximately 10%. 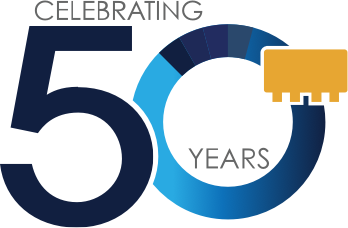 • From an ambient temp of +25°C: a temp decrease to -55°C typically results in a supply current decrease of approximately 10%. • As the VCO frequency increases, difficulty in achieving good pushing is increased. • Good pushing is easier to achieve in designs with high current. • As the VCO frequency increases, difficulty in achieving good pulling is increased. • It is difficult to achieve good pulling when there is a limit on supply current consumption, due to the fact that (connecting a buffer amplifier at the VCO output port) improving pulling increases current consumption. • Higher modulation bandwidth can easily be achieved at higher frequency. • It is easier to achieve good harmonics suppression when frequency range is narrow. • With ambient temperature increase, the harmonic level gets lower. With ambient temperature decrease, the harmonic level gets higher. • As carrier frequency increases, it's more difficult to achieve good phase noise. • It's easy to achieve good phase noise when frequency range is narrow. • Increasing the tuning sensitivity degrades phase noise and vice-versa. • It is typically easy to achieve good phase noise at higher offset frequencies (> 1kHz) in designs with a high supply current. • For a given frequency range it is typically easy to achieve good phase noise in designs with a wide tuning voltage range. • Phase noise varies typically by 3dB in the -55°C to +85°C range. • High pushing can cause phase noise degradation due to increased sensitivity to the power supply noise.